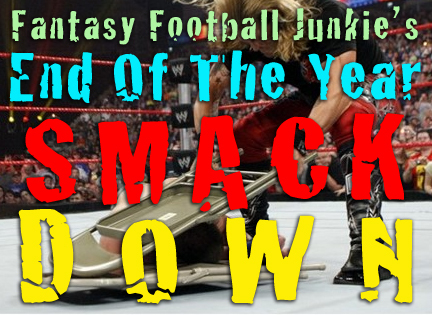 Junkie’s End of the Season Smackdown! So… that title is a little loud. This is not going to be a smackdown of any sorts. Just thought it sounded good. I just got done watching Tim Tebow throw that sweet pass in overtime to Thomas who just so happened to out muscle the Steelers for an 80 yard game-ending touchdown. It was amazing. Especially amazing for Tebow fans and Steeler haters. Which I’m proud to say, I’m both of! Now that I’m a couple weeks late on this post, so much has happened. The Lions made the playoffs for the first time since 1999, YEAH! Then lost to the Saints in the first round, BOO! The coaches for the Rams and Bucs were both fired. The Cowboys didn’t show up against the Giants in week 17 and then the Giants went on to beat the Falcons in round one. Man, they looked like a championship caliber team in both games. Now that the defense is almost 100% healthy, look out Rodgers. The Bengals bungled away a great opportunity to win against the Texans. Drew Brees broke the All-Time yards mark for a single season held by Dan Marino. Heck, Drew Brees broke about 100 records this year in all. The dude was unstoppable down the stretch! He will most certainly win the NFL’s Offensive Player of the Year award while the MVP goes to Aaron Rodgers. And can someone please tell college football enough is enough. Get those bowl games under control. We should not be watching bowl games this late in the year! Sheesh. I mean, come’on. It’s been nearly two months since these teams have hit the field. It’s another season entirely. That’s just a few of the thing that happened in the past two weeks. I know there is much more but I can’t stop thinking about Tebow and the Bronco’s. That just lifted me up. A day after the Lions lost to the Saints I needed something. First the Hoosiers win on the road for only the second time in Tom Crean’s run as head coach for Indiana and second, the Bronco’s beat the Steelers. What a great sports Sunday for the Junkie! As for a fantasy recap, I played in 6 leagues this year. Made the playoffs in 4 of them. Got to the semi-finals in two leagues. One league made it to the championship game before being demolished by my beloved Stafford and Johnson combo. It hurt that the Lions lost versus the Packers and also managed to single-handedly cost me the loss in a league. Devastating. In the fourth league, we do a playoff re-draft and my top four picks are all alive. Probably because I went with Patriots and Packers. Here’s hoping it’s a Tom Brady versus Aaron Rodgers super bowl! 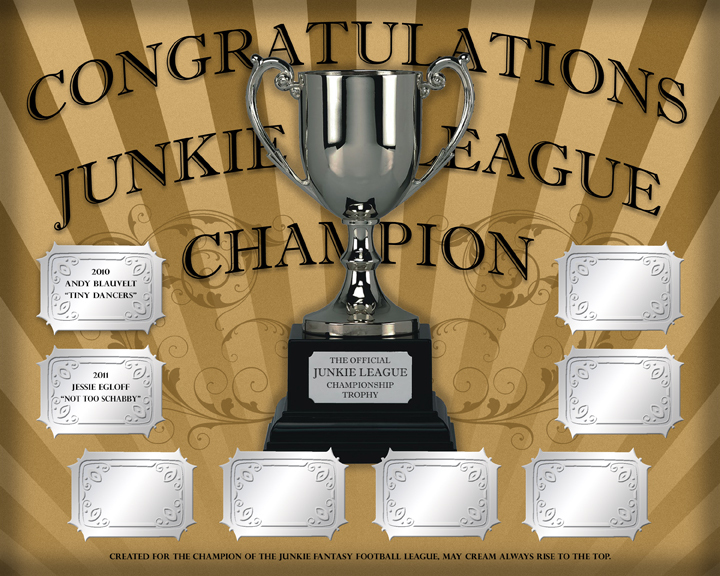 In the Junkie Fantasy League (Where I finished an abysmal 13 out of 14 this year, yikes!) our championship game actually came down to the only two women in the league. Two very active owners who didn’t just happen to get there, so no jokes! It was actually my wife (you go Jill) versus her cousin Jessie. Jessie had the monster team anchored by Aaron Rodgers while Jill had a solid team anchored most of the year by Darren Sproles and Adrian Peterson. It was a good game but in the end, Jessie too Jill down to win it all. I posted the trophy on facebook but here it is again for the whole world to see! Congrats to Jessie for an amazing season. She was the #1 team all year and deserved to take it home! I wouldn’t have gotten as far as I did without help from the Junkie! Thanks for all of your amazing pearls of wisdom throughout the season!